City Rooter’s plumbing professionals can handle any replacements and installation of water service lines on both Commercial and Residential properties. “Before the mid-1950s, the water service pipe that delivers water from the street into each residential home was commonly made of lead, a soft metal that can affect health and has the most impact on the fetus and children under six years old. Lead was also used to solder pipes together before 1990, and can be found in leaded-brass fixtures, such as faucets and valves. 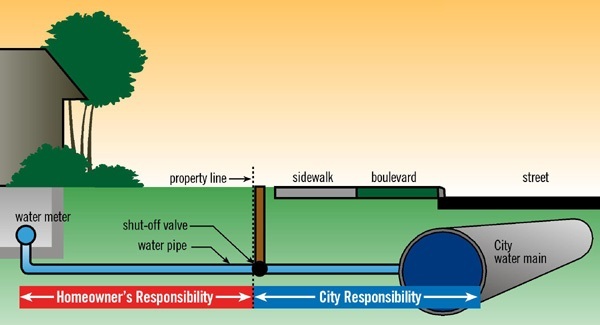 While passing through these pipes and fixtures, lead can be added to drinking water” Source: City of Toronto website. Our Licensed plumbers can determine if you have lead in your water service and replace your old lead pipes with new copper pipes. We will be able to do this quickly and efficiently. If you have leaks or low water pressure our licensed plumber will help you determine the cause and recommend a solution. We also relocate the water meter and fix frozen pipes before they burst and cause some real issues.